It began with an announcement in her church bulletin. 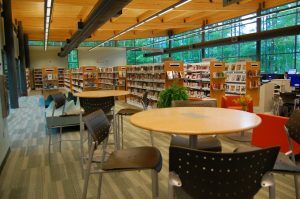 Marie Jones read an article about The North Carolina Literacy Council’s need for volunteers. They were teaming up with her church to teach tutors. With her children managing their own households, her “tribe” of grandchildren (a full dozen), and the recent death of her husband in 2009, she knew it was time to find a new path. With a major in Economics and a minor in Social Studies from Duke, she had enrolled again in school when her own children were teenagers. She became certified to teach K-7. Her excellent high school English teachers at New Hanover High in Wilmington had planted the seeds. So now on her new path, she was ready to tum her education into teaching. Her first student with The North Carolina Literacy Council was a mother of twins who hadn’t finished high school. With Marie’s guidance, the two met twice each week for a year. She’s proud to say that her student obtained her GED 18 years after her original high school enrollment. Marie believes that “if you don’t keep learning, you can easily get behind in a year’s time. The best way to learn,” she says, “is to teach.” Today’s technology also keeps her on her toes and eager to learn. The joy she receives from her students has given her a new purpose in her life. After her move to Springmoor, a fellow resident called within a few days of her arrival and asked if she would join the English as a second language (ESL) teaching program. 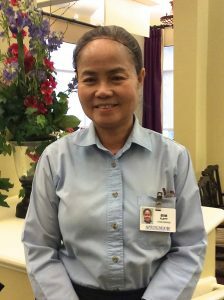 She said it took her only a few seconds to say, “Yes!” Bim Flett, originally from Thailand, became her first student. They’ve worked together over the past two years, meeting weekly for lessons. Bim has been in Raleigh for eight years and works part-time in the North Village dining room at Springmoor. Before her arrival in the States, she had studied the English language in a university in Thailand. She’s found that learning to speak fluently in very challenging. “Brussel sprouts” brings a laugh each time Marie and Bim say it to each other. Learning new sounds and letters that aren’t in the Thai alphabet are very difficult. It’s been helpful for Bim to use a mirror to learn the placement of her tongue, teeth, and lips to pronounce some new English alphabet sounds. Since she and Marie have been working together, Bim has learned to read well and has broadened her vocabulary. Her writing, speaking, and spelling have all advanced. As a reward for her steady work, Marie recently took Bim to the Cameron Village Library. At age 55, Bim got her first library card. The excitement on her face was worth everything to Marie. Knowing that she could check out books at any time was the best gift Bim could have received. 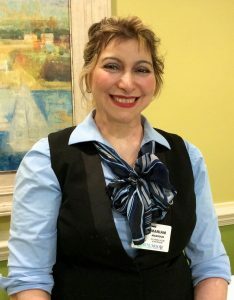 With spring approaching, Marie has planned trips to the Museum of Natural Sciences, the North Carolina Museum of Art, and for fun to Pullen Park. She’s excited to ride the Carousel with Bim! The two explore language through outings as well as through books. Last month, Bim asked Marie to show her how to set a proper table with a full place setting. In return, Bim taught her proper etiquette for a dinner guest in a Thai home and described the contrast in table settings and table manners. When asked about Marie, Bim quickly says, “I feel like she is my mother not my teacher.” The confidence she has given her helps every day as she speaks more and more of her second language. 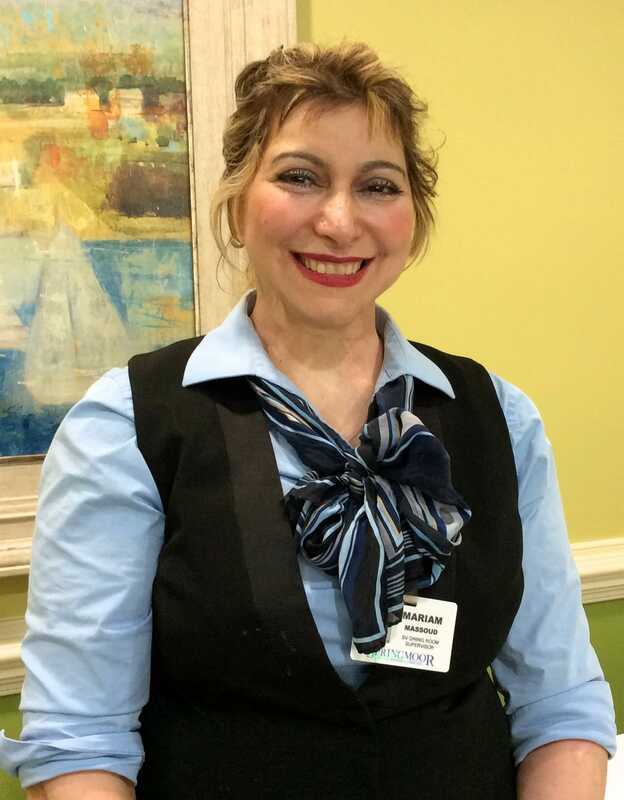 Miriam Massoud has been a Springmoor employee for ten years. She came to the United States from Egypt as a licensed, experienced veterinarian. In order to practice in the US, she must pass the English language proficiency exam before she’s allowed to take the Veterinary Board exam. Since last fall, Marie and Miriam have worked together to prepare for this rigorous test in April or May. All South Village Springmoor residents who know and love Miriam are pulling for her to make her dream of practicing veterinary medicine again a reality! When describing her teacher, Miriam says, “Mrs. Jones goes above and beyond to help me. She puts in a tremendous amount of effort to prepare the lessons each week. She is tough when she needs to be and always keeps me on the right track. She doesn’t take no for an answer!” Miriam recalls the day that Marie gave her a binder for her work. It had her name on it, and it has since become filled with homework assignments. 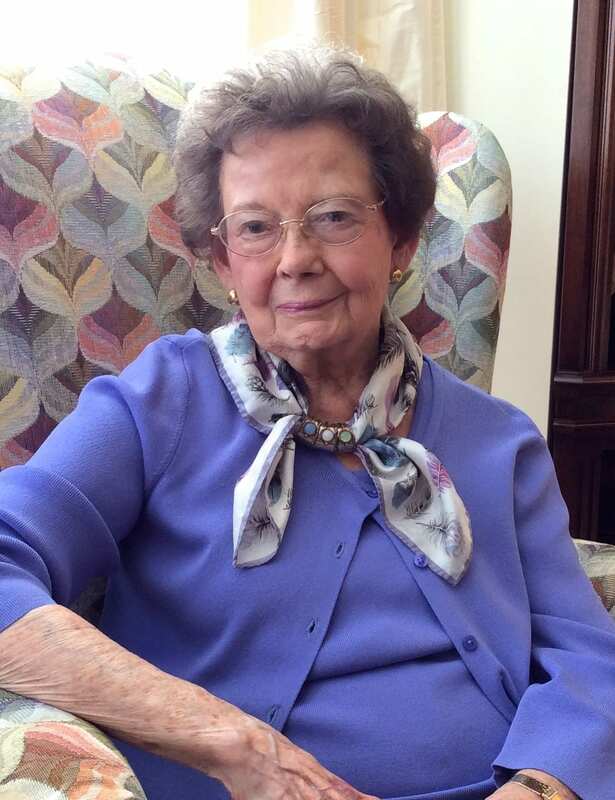 “She touched my heart when she bought the TOELF (Test of English as a Foreign Language) book.” No one had ever dedicated so much time and research to help Miriam. Marie did her research online and has found numerous lessons and practice tests to help Miriam. The 4 to 5 hour exam is broken down into four categories: listening, speaking, reading and writing. The writing and speaking parts have proven to be the most difficult. For her part, Miriam researched keyboarding. She never had used a typewriter so writing a timed essay during the exam is a skill she had to master too. She now studies each night with her high school and college sons by her side. The teacher continues to learn! The joy Marie has received from her students is evident as she tells her story. 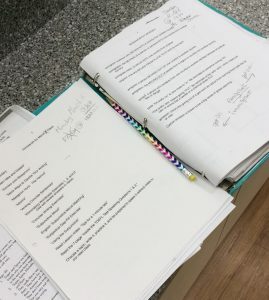 Her dedication to helping others has given her more than she could have ever imagined the day she read the church newsletter announcement of a tutor training class in 2009. Her hope is that other Springmoor residents will share her joy in teaching newcomers the English language!